Songbirds are one of the best systems for understanding how the brain controls complex behavior. Image credit: Sam Sober. Timing is key for brain cells controlling a complex motor activity like the singing of a bird, finds a new study published by PLOS Biology. The findings are the first to suggest that fine-scale timing of neurons is at least as important in motor systems as in sensory systems, and perhaps more critical. Sober’s lab uses Bengalese finches, also known as society finches, as a model system. The way birds control their song has a lot in common with human speech, both in how it’s learned early in life and how it’s vocalized in adults. The neural pathways for birdsong are also well known, and restricted to that one activity. 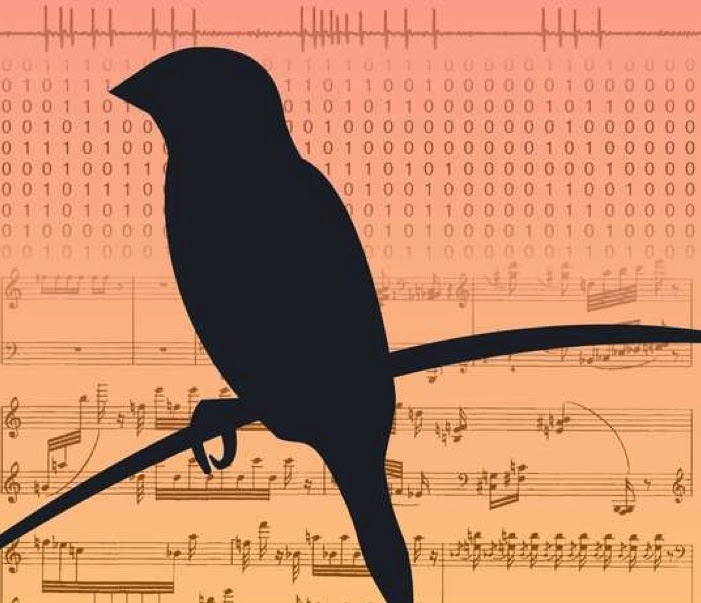 “Songbirds are the best system for understanding how the brain controls complex vocal behavior, and one of the best systems for understanding control of motor behavior in general,” Sober says. Researchers have long known that for an organism to interpret sensory information – such as sight, sound and taste – the timing of spikes in brain cells can matter more than the rate, or the total number of times they fire. Studies on flies, for instance, have shown that their visual systems are highly sensitive to the movement of shadows. By looking at the timing of spikes in the fly’s neurons you can tell the velocity of a shadow that the fly is seeing. An animal’s physical response to a stimulus, however, is much slower than the millisecond timescale on which spikes are produced. “There was an assumption that because muscles have a relatively slow response time, a timing code in neurons could not make a difference in controlling movement of the body,” Sober says. An Emory undergraduate in the Sober lab, Claire Tang, got the idea of testing that assumption. She proposed an experiment involving mathematical methods that she was learning in a Physical Biology class. The class was taught by Emory biophysicist Ilya Nemenman, an expert in the use of computational techniques to study biological systems. Co-authors also include Nemenman; laboratory technician Diala Chehayeb; and Kyle Srivastava, a graduate student in the Emory/Georgia Tech graduate program in biomedical engineering. The researchers used an array of electrodes, each thinner than a human hair, to record the activity of single neurons of adult finches as they were singing. The acoustic signals of the birdsong were recorded alongside the timing and the rate that single neurons fired. The researchers applied information theory, a discipline originally designed to analyze communications systems such as the Internet or cellular phones, to analyze how much one could learn about the behavior of the bird singing by looking at the precise timing of the spikes versus their number. The result showed that for the duration of one song signal, or 40 milliseconds, the timing of the spikes contained 10 times more information than the rate of the spikes. “Our findings make it pretty clear that you may be missing a lot of the information in the neural code unless you consider the timing,” Sober says. Such improvements in our understanding of how the brain controls physical movement hold many potential health applications, he adds. The research was supported by grants from the National Institutes of Health, the National Science Foundation, the James S. McDonnell Foundation and Emory’s Computational Neuroscience Training Program. Bird graphic courtesy of Sam Sober.